Sazerac Gastro Lounge is a restaurant whose theme originated in New Orleans, so it caught my eye because I do enjoy some “creole” cuisine. There are over 200 restaurants that partake in winterlicious, so it can be hard to narrow it down. I hadn’t heard of this restaurant before and this was the best opportunity to take advantage of trying out somewhere new. Also, whenever I’d mentioned the name to people, they kept correcting me and saying “you mean Sassafraz?”. No. Sazerac! That very reaction from others helped me settle on my decision because I didn’t know anyone who’d been there. I liked the restaurant’s layout; it appeared small but was actually spacious with a galley (long and narrow) feel to it. It was very quaint and modern. The diners were seated against the far wall (with great artwork, might I add) and there was a bar on the opposite side. Further down to the back of the restaurant, beside the bar, there were tables with benches (long ottomans, if you will) for bigger groups. I’d be concerned about my back sitting there, but they suit the decor all the same. The staff was welcoming and very engaging, even offering honest opinions when my friend was trying to decide what to eat. The server engaged in small talk every time he came by, and although at the end we sat for a while waiting for someone to retrieve our payments, he feigned some interest in what we were doing after dinner. If he wasn’t available, there were other servers to replenish our water or bring our meals. The salad was the best part of the meal; even after we’d left we couldn’t stop talking about it! It was Warm Crusted Goat cheese Salad (Candied Walnuts and Cranberries, Panko Crusted Goat Cheese, Mixed Greens, Apple Cranberry Vinaigrette). It was DE-LI-CIOUS. Warm crusted goat cheese, ladies and gentlemen. Goat cheese in a batter. The candied walnuts on the spinach tasted lovely with the vinaigrette but it was all about the CRUSTED GOAT CHEESE. Need I say more? 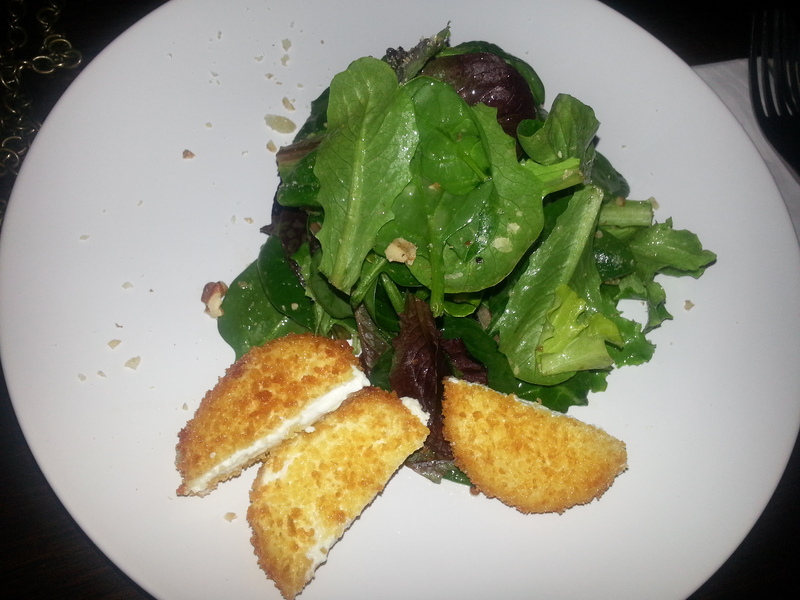 Okay… one more time… CRUSTED GOAT CHEESE! The end. 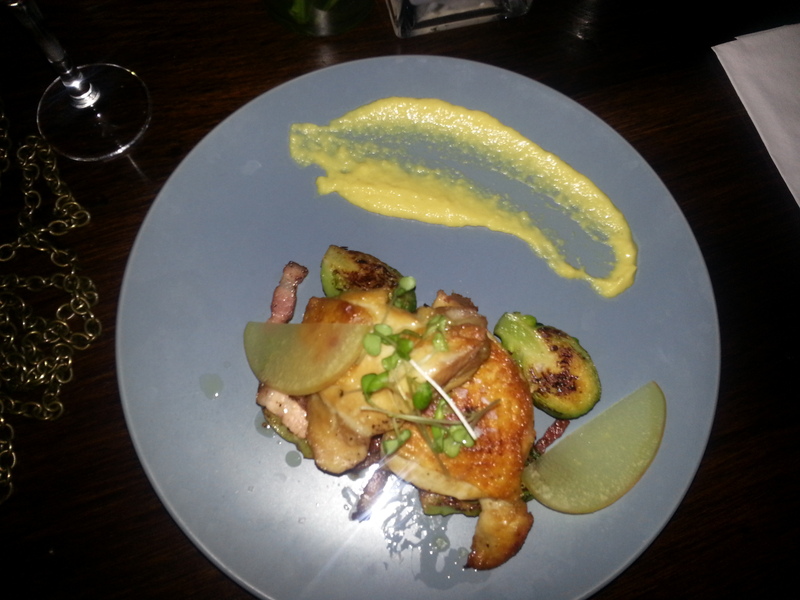 I ordered the Chantecler Rouge Chicken (with Corn Grits, Apples, Collard Greens, and Brussels’ Sprout). Do you see pork in that description? It tasted like the small bits of salty meat were pork and I do not eat pork so I got a little turned off. Had this been a regular evening, I would have said something, but it was the winterlicious menu and I didn’t care for the two other options anyway. Plus, what would they have replaced it with, a couple more Brussels’ sprouts? Nah it’s okay, though the Brussels’ sprouts were surprisingly tasty (and that’s saying a lot because I REALLY don’t care for them). I asked my friend to try the bits and she also was certain they tasted like pork and valiantly came to my rescue retrieving all the pieces. The small bits could have been chicken, but they were really salty and had a bacon taste to them. It didn’t matter because I didn’t want to try them again. The chicken was tasty, a bit salty for my liking (but that could be because I don’t eat much salt), but nothing really to write home about. Anyway, the fusion of sweet from corn grits blended nicely with the chicken and the thin apple slices were more of a garnish than anything. 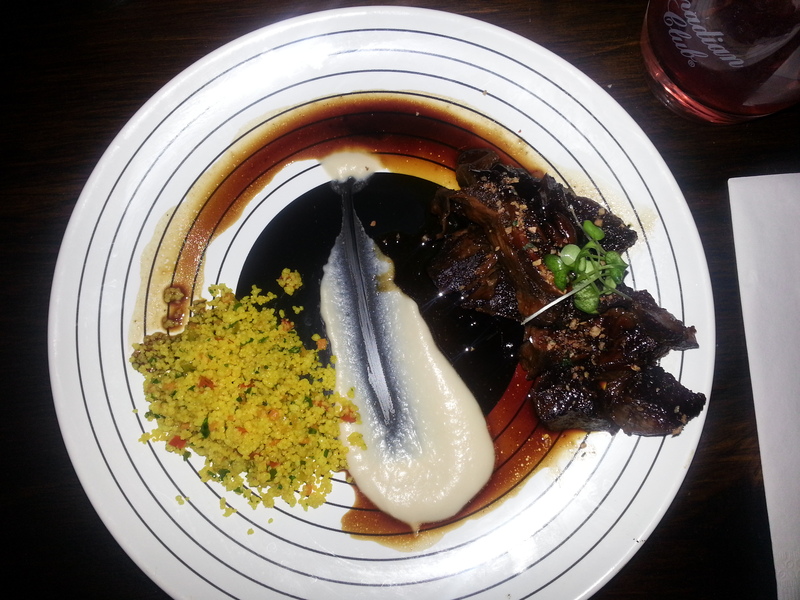 My friend ordered the Braised Short Ribs (with Carrot Puree, Baby Heirloom Carrots, Israeli Couscous, And White Bean Pure). She really enjoyed the ribs; said they were tender and tasty almost melting in her mouth. And though she didn’t think she’d like the bean puree, she commented it was a nice blend with the ribs. Her serving was a generous one (she noted her surprise a couple of times), so she had no complaints about her meal. She didn’t think the couscous was the right side for the meal, but thought they were okay. But the ribs, she said, were very good. 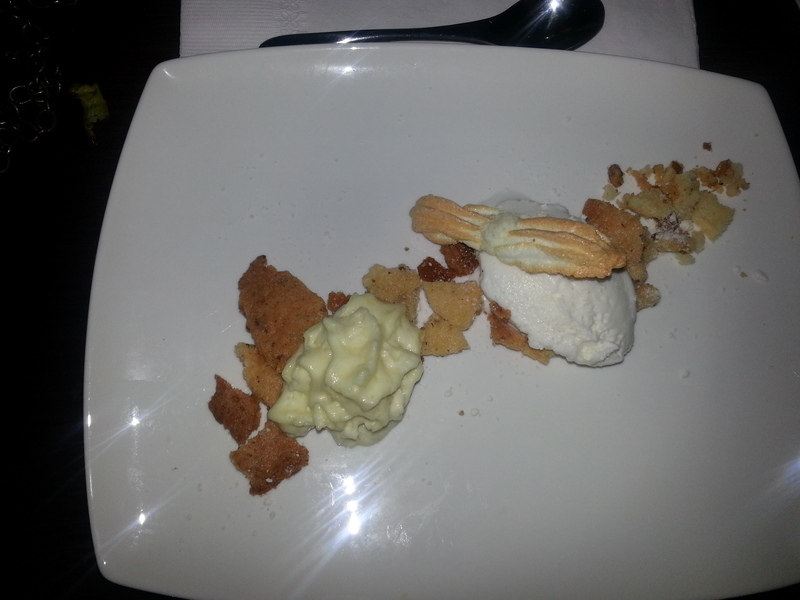 I ordered the Lemon Custard with Coconut Meringue (Lemon custard, Coconut Meringue, Sugar Cookie Crumble,Coconut Ice Cream, White Chocolate) and it was GOOD. I liked the cookie crumble and I can never ever in my entire life get enough of white chocolate. The lemon custard added a nice tartness in contrast to the white chocolate’s sweetness. And where can you go wrong with coconut ice cream?? 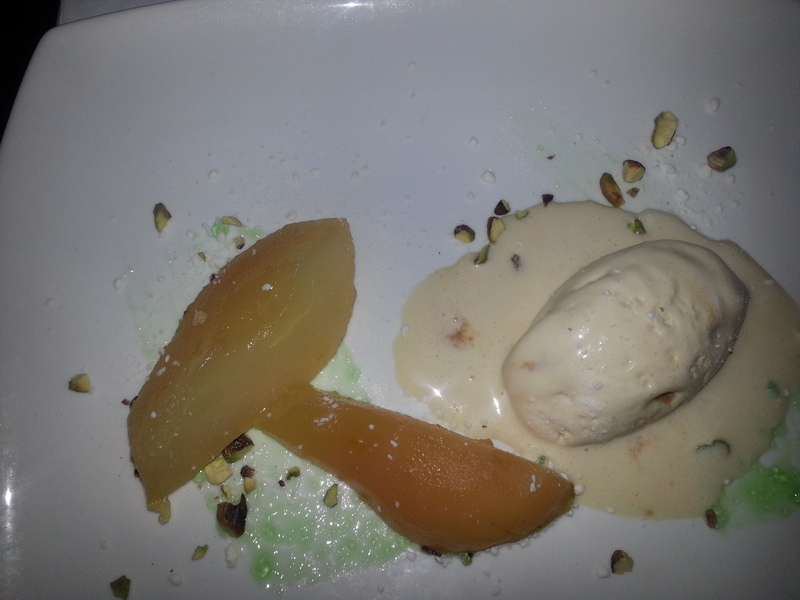 My friend ordered the Warm honey poached pear (Red Wine Poached Pear, Pistachios, Salted Caramel Goat Ice Cream, Mint Puree) and she thought the salted caramel was its saving grace since “cooked” fruits take some getting used to. I tried it as well and she was right – the salted caramel goat ice cream was quite good. It wasn’t anything to get excited about, and we agreed my choice was the better of the two. The meal was the winterlicious prix-fixe of $25, and with that the portions were smaller. I did look at their regular menu and the prices are on the higher side, you can say. I ordered a Picasso Blue (brut, guava juice and wild blueberry syrup) cocktail which cost me $10 (regular price $12). But with that said, the regular prices suit the location (Bathurst and King). Even with the mishap I did enjoy the evening. The ambiance was nice and the staff was extremely pleasant. The menu offered enough variety considering it was limited, and the items were tasty. It’s easy to find and there is parking right in front of the restaurant on King St – if you get there early enough. If you don’t mind spending a little more on your meal and would like to try somewhere new (and you eat all types of meat! ), I’d suggest it. Sazerac Gastro Lounge is located at 782 King St W (west of Bathurst) (647) 342-8866.
::Update:: – Sazerac Gastro Lounge is now Cabal Social Gastro Lounge http://cabalsocial.com/.